Latest Release of StayLinked SmartTE Now Available! In response to the demands of the increasing trend of Supply Chain applications migrating to Android mobile device environments, StayLinked has unveiled new features in the industry-leading terminal emulation modernization platform, SmartTE. As you may have experienced, StayLinked SmartTE is the revolutionary Terminal Emulation (TE) Modernization solution that is fueling the massive migration from Windows-based devices to touchscreen Android mobile devices in the supply chain. 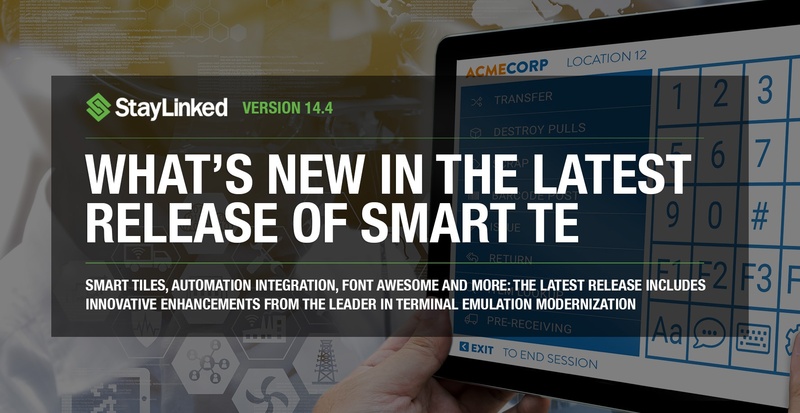 In this release, v14.4, we're proud to introduce innovative features further cementing SmartTE as the premier TE Modernization solution for the industry. One of the key features is StayLinked Smart Tiles which are an innovative approach to the touch-only user experience allowing the creation and maintenance of custom keyboards, custom toolbars, or any collection of buttons at a layer above the application. Provide custom, graphical on-screen buttons for various tasks, independent of the emulation screen. Can be used to create and maintain custom keyboards, custom toolbars or any collection of buttons. Create and update your SmartTiles Collections using a graphical drag-and-drop tile designer dialog. Each SmartTiles Collection can contain one or more ‘Pages’ of related, graphical, on-screen buttons. Collections can be assigned to devices using Client Settings or Screen Recognition Host APIs. SmartTiles Collections are centrally-managed, and changes deployed to devices in real-time, on the fly. Export SmartTiles Collections and import them into other StayLinked SmartTE Servers. "SmartTE v14.4 increases the available options and ease-of-use of graphical elements making modernization easier and faster than ever," said Justin Griffith, CTO, StayLinked. "And the Automation API delivers capabilities never before available in a Terminal Emulation product." Smart Tiles - Provide custom, graphical on-screen buttons for various tasks, independent of the emulation screen. Smart Tiles can be used to create and maintain custom keyboards, custom toolbars and buttons. Graphics enhancements through iconic font integration – Provides device-based, low resource graphics, eliminating need to manage or distribute an image library and avoiding inordinate design services. New Automation capabilities – Easily integrate Terminal Emulation with automation systems (conveyors, e.g.) with no changes required to existing applications. Traditionally, the integration of TE and automation systems is an expensive and complicated project. SmartTE can provide the same results in just hours. "As the industry moves to touchscreen Android mobile devices, existing applications must migrate as well," said Dan Hogan, President, StayLinked. "This release further establishes SmartTE as the most advanced - and only viable - TE modernization solution in enterprise mobility."